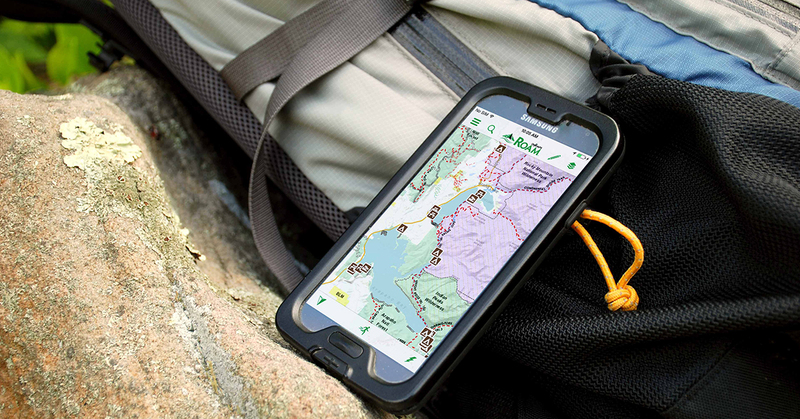 This all-new GPS mapping technology allows you to find trails and navigate deep in the backcountry with your Android or iOS mobile device. Say goodbye to ripped maps and expensive GPS units forever! We all enjoy wilderness adventures, yet none of us enjoy having to stop along the trail to pull maps from our packs. Then there is the hassle of folding them back up. I don’t know about you, but I usually feel like a drunk monkey every time I try to fold those creases. Fortunately, thanks to the latest GPS and mapping technology, we no longer have to navigate by way of those cumbersome and damage-prone USGS quadrangles, or triangulate our positions with a magnetic compass. The downside, however, is that a quality stand-alone GPS unit with detailed mapping software doesn’t come cheap. So here’s the good news—there is a new navigation technology that delivers all the detail you expect from a 7.5-minute quadrangle topo map, all the critical and customizable navigation functions of a high-end GPS unit, plus a variety of user-selectable map overlays that exceed the detail and information typically associated with expensive mapping software. Best of all, you can use and access all of this powerful navigation technology with an item you already carry with you…your mobile phone. A company called onXmaps developed the recently released ROAM App to provide full and customizable navigation software on your Android or iOS mobile device. For an annual subscription of $9.99, your phone not only replaces expensive handheld GPS systems and their limited mapping databases, but also delivers map layers that have never before been combined into a single, mobile platform. You can go here to download the ROAM App and see what we’re talking about. I’ve had the opportunity to test the ROAM App in the Montana backcountry, as have some friends who like to camp and backpack in Alaska. So far, we’ve been surprised and impressed that a mobile app can both replace and provide expanded mapping data that was formerly limited to conventional GPS systems or old-school topos. Now, getting from here to there takes little more than a swipe and a tap of my phone. ROAM is available for all 50 states, and features BASEMAPS that consist of satellite imagery, topographic lines, aerial imagery, and many more databases. Of course, the ROAM App works in conjunction with your phone’s internal GPS to show your precise location on the map, and since your phone’s GPS function does not rely on cell reception, it works no matter how far you are in the backountry. The satellite imagery shows every landscape feature you could want to see, with higher definition and greater detail than other GPS maps, even when zoomed in. What really sets the ROAM App apart from other products, however, are the map layers. The onXmaps GIS team installed over ten different layers to fit on top of your BASEMAPS, showing specific information customized for the trip you’re on or are planning. The USA Trails layer, for example, may be the most useful layer, as it shows and labels trails from all over the country. Practically everything from the extensive Pacific Coast Trail to short hikes in your nearby state forest are featured on this layer. For off-trail use, the Private Parcels layer shows property boundaries along with the names of property owners, while also displaying public lands that you can camp and hike on, such as BLM and Forest Service holdings. There are even layers which display National Park and National Forest visitor maps. The most useful function of the maps, though, is their saving capabilities. Anyone who loves the outdoors appreciates getting away from cell service. To keep your maps available, ROAM allows you to save your maps before heading out. When scouting your backcountry trail from home, you can save the map and its layers. Later, when you’re on the trail, you can open the map and begin your navigation. Your phone’s GPS will still show you where on the trail you are. To save your phone’s battery life, simply turn on the airplane mode. 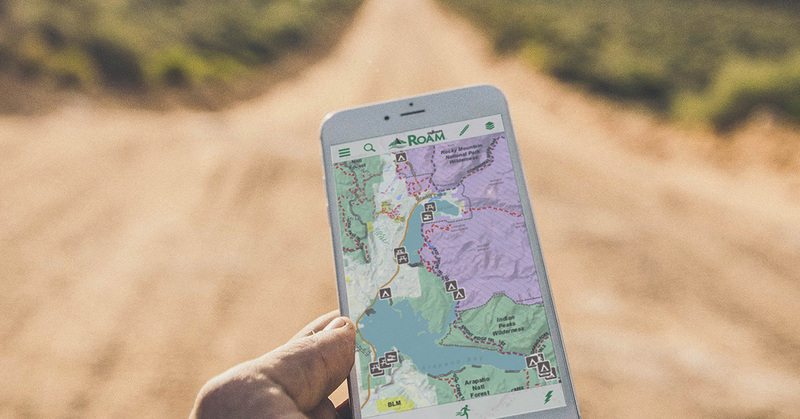 Even in the most remote areas in the country, ROAM has the data to help you find your next adventure. In a small fishing village over 200 miles from Anchorage, Alaska, where the only way in is by boat or plane, Shelby Dunn uses her ROAM App to find the next river or stream in which to cast her fly rod. Dunn saves her maps before leaving the village where she teaches and accesses them when she is in the bush. Dunn even leaves a trail of digital breadcrumbs to follow back to the village by using ROAM’s tracking feature. The tracking function maps out every step she takes and tells her how far she has hiked. When the Alaska nights sneak up, all Dunn has to do is follow her tracks back home. Exploring the harsh Alaskan wilderness, in between teaching in a village of 150 people with no roads in or out, is not an easy lifestyle, but it is one that Dunn is enjoying more and with greater confidence since she has been using her ROAM App. Go here to download the ROAM App and get started today!